Secretary’s report: Posted on line, motion by Gene G, 2nd by Ken R- approved. Reported three letters from scholarship recipients received and placed in notebook. Also received letter from BTC foundation thanking the chapter for its donation. Treasurer’s report: Distributed motion by Ken R 23nd by Gene G approved, but noted that the funds earmarked for the national convention must be amended. Membership Update: With the three new members we are getting close to 300 members – another delegate to national. Received a letter from Ann Beck (WWU) detailing money for veteran’s use. Tom Modica, Randy Turnbull, Dale Boe, Sam Houston & Dave Loomis delivered a new ping pong table we donated to the Coast Guard Station. $725.00 donated to Children of Vietnam, Dragoon fund to support (5) kids in school. Richard Brummett gave a short report on the status. The fund has a net gain of 2 kids. It now supports 57 (from a start of 6). The cost averages $146 / year. Joel Douglas is investigating obtaining a military vehicle for the Memorial Day parade and possibly the car show. Our annual spousal dinner will be held at the VFW on 4 December 2018. Social hour begins at 17:30 (5:30 pm) The dinner will be covered by donation to defray the cost. A discussion about possibly using Lairmont Manor for the venue was held. Decision to stay at the VFW. A wheelchair ramp to the basement of VFW Post 1585 is now operational. Members who are limited in mobility can now join us. Please come and check it out. For God Bless Our Veterans bumper stickers, memorial bricks and donations to the Vietnam Memorial contact Gene Goldsmith. The state Council meeting will be held 13 Oct. 2018 from 10:00 to 13:00 at the pancake house on Snoqualmie Pass. Dave L, Gene G and Ron W will attend. The national convention will be held in Spokane 16-20 July 2019. Our Chapter gets six delegates. Dave L, Ken R, Gene G, Wojo, D. Martinson will attend. Anyone else? We have earmarked funds for our delegates. DAV selling poppies on Veterans Day. Gene needs folks for 4-hour shifts. Please contact him. Request from Ann Beck, WWU, for $5,000 to help fund endowment at WWU for veteran students. Many questions asked, much discussion ensued. Motion by Ron W., but no 2nd motion failed. Joel D. recapped the veterans’ picnic at Lairmont Manor, with an album of photos passed around. 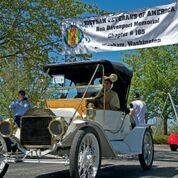 Car Show recap, applause awarded to the guilty parties (Tom M., Sam H., Randy T., Bill B., Dale B., Wojo, Richard M, Rosie L. and others who I am forgetting). Jim Rothenbuhler and Jim Mains presented a $500 check from the Gear Heads car club to be credited to the car show. Doc H. presented a $750 check from Superfeet also to be credited to the car show. Ken R. moved that $2000 be allocated to fund convention delegates to the national convention in Spokane in 2019. 2nd by Lonnie R. discussion followed, motion approved. Ken R. moved to give $3000 to the Whatcom Allied Veteran’s Council for the purpose of assisting the creation of the Vietnam War memorial in Greenacres Memorial Park. 2nd by Tom G, question if in the spirit of the mission statement, decided that it is. Approved overwhelmingly. Tom M. moved that the chapter buy a ping-pong table for the local Coast Guard Detachment not to exceed $600. 2nd by Ken R. discussion if this is in spirit of our mission statement. Decided that those presently serving are veterans and thus deserving. John F. questioned why the C.G. does not supply. Question called approved with one dissenting vote. Frank W. announced he will not be available to cook next meeting. No decision on substitute…but ideas abound. 50 / 50 raffle take $36. The VFW Post 1585 pig roast happens on 15 September, it is a fund raiser to help pay for the new accessible ramp to the basement. VFW 9301 breakfast 8:00 – 11:00 15 Sept.
VFW 1585 breakfast 8:00 – 10:00 30 Sept.
On a picture-perfect Sunday morning, some participants arrived earlier than 7:00 a.m. for the Chapter’s big fund raiser, the 8th Annual Car Show. 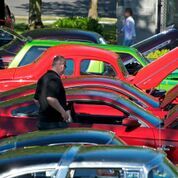 More than 350 vehicles registered and were shown at the large parking lot in Barkley Village. The vehicles ran the gamut from early vintage to late model. 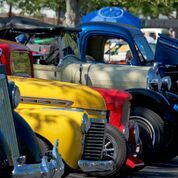 Some of my favorites were a white early model Ford, a late model Corvette, a late ‘60’s Camaro and a Willys Jeepster. First, second and third place awards were given by decades, with pre-1920 to the present. A special award was given to the Vietnam Era as well as People’s Choice. The awards were presented on Victory Lane, under the car show banner. Solicit raffle prizes for WWII & Korean War picnic 21 August at Lairmont Manor. 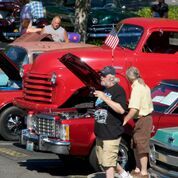 Car Show update – July 22nd is approaching fast. Tom M reported a dearth of volunteers. We need people for many positions from registration to raffle sales to car judging. Let’s get to it people. Discussion that the Coast Guard detachment will provide several, and possibly get some from Marine Corps League. Are there any other ideas? There will be a pre-show meeting at Barkley Center – the car show location on 17 July (Tuesday) at 18:00 (6:00 pm) to lay out locations and duties. We also need people with pickups to meet at the VFW on 21 July at 17:00 to load up tables, chairs, garbage cans, banners etc to take to the venue on Sunday morning. Safety cones are being provided by Safety Signs Inc. Tape may be purchased. Pres. Loomis will issue an e-mail blast every week to recruit volunteers and alert members of the upcoming event. The VFW Post 1585 will celebrate its 90th birthday with an open house honoring all veterans and their families. Refreshments provided. A raffle for 104.2 troy ounce silver bar is one of the highlights. A request received from Liz Harmon at Whatcom County Health Department to assist a Navy veteran in need of vehicle repair. Pres. Loomis advanced a check for $300.00, reimbursed by the Chapter at the meeting. Ann Beck, Assistant Director of Veterans Services at Western Washington University spoke about the work her office does. She presented many statistics and trends. All in all, there are about 220 active veteran students enrolled and nearly that number of dependants. Since 2013 the number of women vets has risen 168% (54% for guys). Kids of 100% disabled vets has seen a 98% growth. Generally speaking veteran/students have a quicker rate to graduation. And they tend to be oriented to the studies that will result in faster employment. Ms. Beck also spoke to establishing a scholarship endowment for veterans. One individual has pledged $10,000 and her office has a matching pledge bringing the total to $20,000. But WWU has a threshold of $25,000 to establish an endowed scholarship. So they are looking for another $5,000. The chapter will discuss at the next meeting the possibility of assisting in this endeavor. 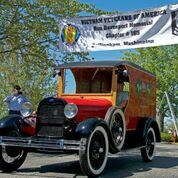 the City of Blaine holds a 4th of July celebration (with parade, car show, etc. on Wednesday be there or be square. Discussion on item introduced by Ron Wilson for some accounting for the meal resulted in agreement that itemization in the minutes will suffice. Collection for dinner totaled $118.00. Cost $95.00 which means that we came out $23 to the good. Legion Post 7 hosts a breakfast 15 July 9:00 to noon. VFW 9301 will have its breakfast 8:00 to 11:00 on 21 July. VFW 1585 has a breakfast 8:00 to 10:00 29 July.